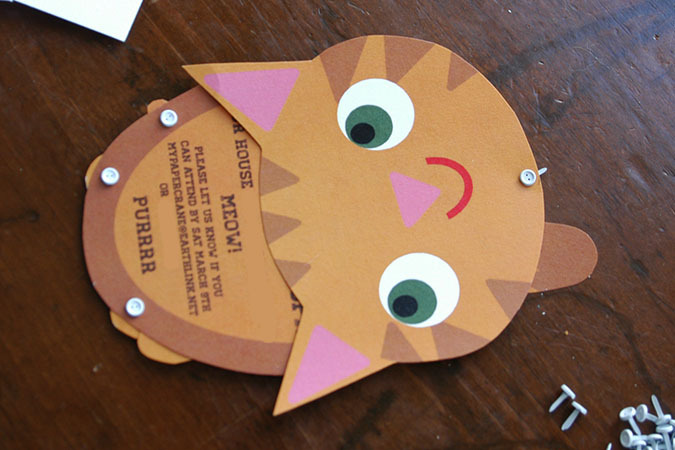 My youngest son has a birthday coming up and he is one cat crazy fella, he decided he wanted a cat-themed birthday party so we have been having fun coming up with ideas for it. It’s sneaking up on us quickly so I made up some invitations the other day so we could quickly get them into the mail. 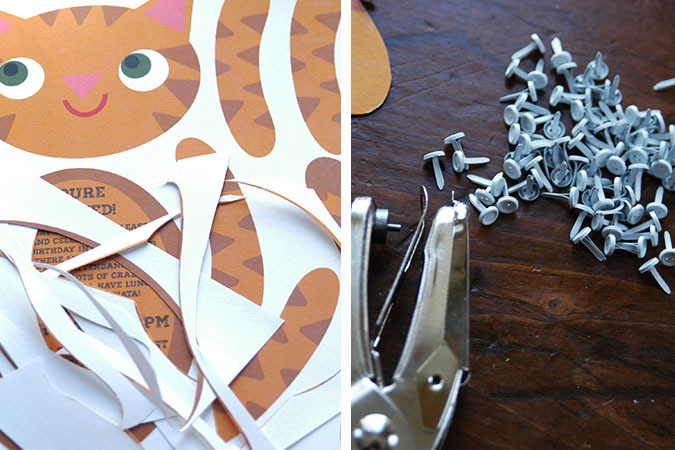 You simply print them on cardstock, cut them out, punch little holes for the brad fasteners and put them together! I found the tiny brads that look like buttons at Michael’s craft store. Once made you can fold them up and fit them into card sized envelopes. 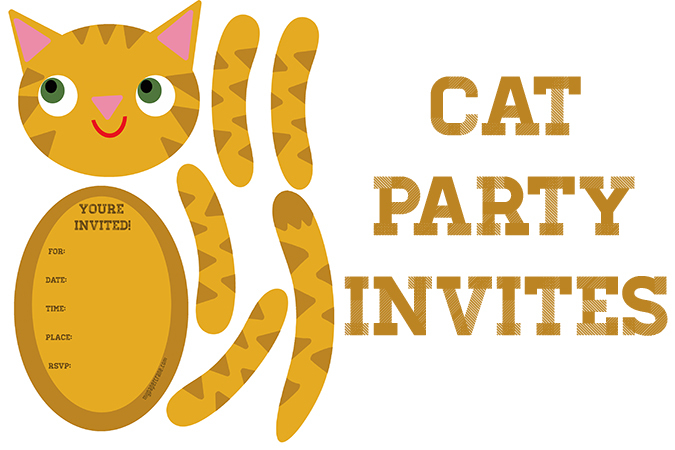 I made a plain invitation for you if you’d like to use it for a cat party of your own. Download it here These invitations are free for personal use only. Personal use means non-commercial use of the invitations including copies and print outs for yourself, and to give to friends. The invitations may not be used in any way whatsoever in which you charge money, collect fees, or receive any form of remuneration. The invitations may not be used in advertising, and they may not be resold. 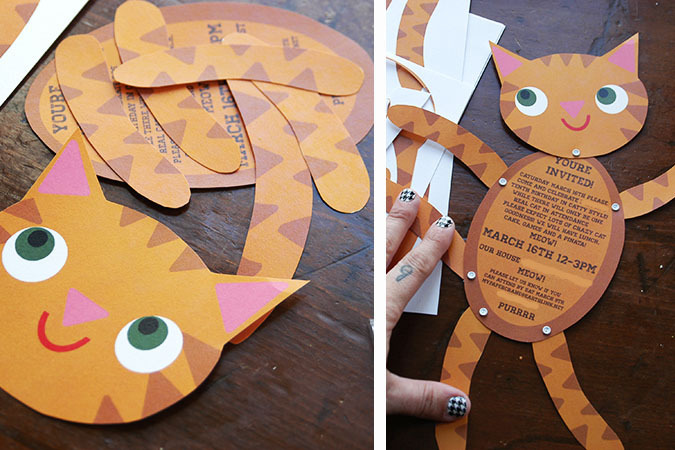 Tagged cat, DIY, my work, party, printable. Bookmark the permalink. Very cute! Our little guy loves kitties too, and I can never find cat stuff for boys! Even the black cat shirts for Halloween are mostly all girly. I can’t wait to see what other goodies you come up with. All I could think of when I saw this was the cat bus from Totoro. Sooooo cute! I love them! i can’t wait to see what else you do for the party! These are great! And so glad to know there’s another little guy who’s cat crazy like my 8 year old boy. I think it’s great that you thought far enough ahead to make the invitation fit into an envelope! How clever! Just the excitement to unfold the invitation just to see what it is – did me in with cuteness! heheeeeeeeeeeeee! So cute & interactive! Love it! LOVE! 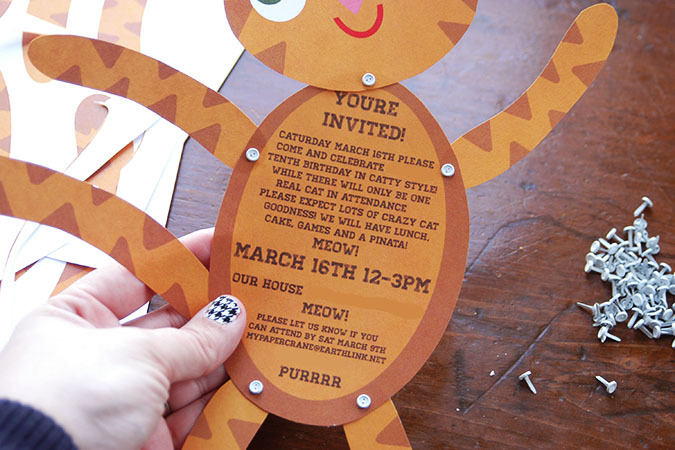 I want to come to this party – I had a kitty themed birthday once when I was little and it was the cat’s meow! I remember making dolls like this as a kid all the time! I think I might make some easter cards now in this style to send out. Thank you for this cute kitty cat invite, I made a print. And made it into a ‘day out gift’ for my sister. We both love cats, she has four devon rex cats and I have a Burmese and a cyper. We are gone go to a workshop to make stamps. Think she will love it, because she is a snailmail lover. These are oh-so-cute idea. This is perfect both for boys or girls important day.